The VIP Club is a monthly subscription based service designed exclusive for those who are serious about getting results from energy healing and the Law of Attraction. No amount of pre-recorded material can possibly address every challenge and issue that comes up, so the VIP Club gives you regular, live access to me, Brent Michael Phillips, to work with you to solve the important problems in your life. There are three levels of membership: GOLD, SILVER, and BRONZE. There is no money back guarantee on Gold membership because you get instant access to the entire archive of thousands of VIP Club Masterclasses, articles, videos, calls, and audios from the last 10+ years. Which level of the VIP Club Membership is right for me? The GOLD Level member is the highest level of premium access, for those with a serious commitment to spiritual development and transformation. With GOLD, you’ll save hundreds of dollars over the same duration SILVER membership, plus you get the highest level of priority on all VIP Club events, and instant access to the EVERYTHING: all live events and recordings, plus the entire archive of thousands of VIP Club articles, videos, audios, calls, and sessions back several years to the beginning of the VIP Club in 2009. The SILVER Level membership is designed for those who want priority access to the live events – in particular the weekly practice groups (which are not available at BRONZE level), as well as three times as many VIP Club Special Event Masterclass lessons, but aren’t ready to make the year-long commitment to GOLD Level. The BRONZE Level membership is designed for those are still struggling with money and can not yet afford a higher level membership…but we’re confident that if you use the VIP Club tools, all of our BRONZE members will see positive transformations and want to upgrade soon! I’ve has literally spent decades and many hundreds of thousands of dollars to learn and create all this material so I can present it to you on a silver platter. I knows the world desperately needs the inexpensive, frequent live access to a Master Healer and genuine genius, and I want to make all this amazing content and live access available to you at a tiny fraction of the time and money I spent to learn it. 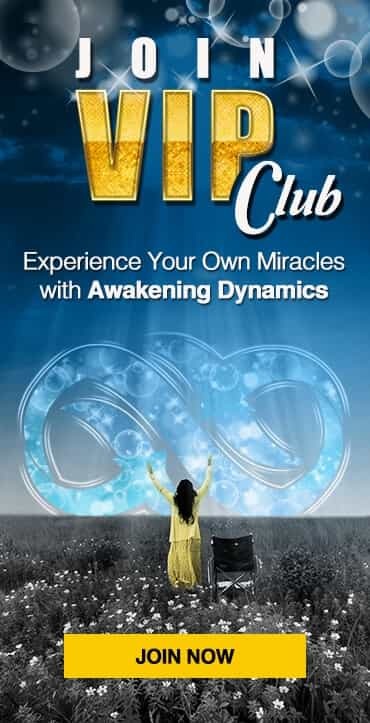 You won’t find any program or system that offers anywhere near the same amount of high-quality content and frequent live, personal access as the Awakening Dynamics VIP Club! Add it all up and that's $1677.64 of value for just $37 - with a 30 day unconditional 100% money back guarantee! If you are using a coupon you received from purchasing a special offer package, please select Bronze. After you setup your Bronze level account, you can upgrade to Silver at any time. and you may cancel or downgrade your membership at any time. Gold membership gives you everything available to Silver members, plus a lot more...and you save $194 over a year long Silver membership! After 1 year, your account will automatically reset to Bronze membership, which you can upgrade or cancel at any time. There is no money back guarantee on Gold membership because you get instant access to the entire archive of thousands of VIP Club articles, videos, calls, and audios. © 2018 - Awakening Dynamics - All rights Reserved.